Kane has secured a big match against Seth Rollins at WWE Hell in a Cell. Can Kane convert into the Demon permanently and experience a rebirth of sorts in the WWE? According to a post on WWE.com, Corporate Kane was recently suspended and his presence has been absent from WWE programming ever since. 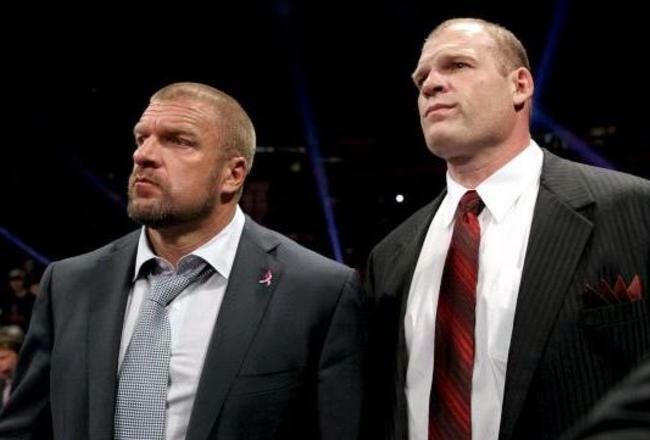 Could we consider the Corporate Kane gimmick to be over? It would be unlikely that the WWE would want to go forward with the Corporate Kane storyline, given the fact that he has begun alienating himself from The Authority. Most wrestling experts believe that Kane has little to no shot of leaving Hell in a Cell with the WWE Championship. Although Kane’s physically imposing demeanor should give him the advantage, Seth Rollins has consistently found ways to win big matches. Kane’s match with Seth Rollins will be more about Kane coming back into the WWE with his old persona, giving him a clean switch from the Corporate Kane persona. With the Demon Kane back in the WWE, storylines can continue to develop around his character that do not pertain to Seth Rollins or the Authority. With Kane and Seth Rollins squaring off this Sunday evening, Hell in a Cell will be sure to full of surprises. At WWE Night of Champions, Sheamus tried to cash in his Money in the Bank briefcase at the end of the main event. Kane ruined this attempt, forcing Sheamus to retain the Money in the Bank briefcase. Although Sheamus hasn’t been vocal about using Money in the Bank contract at Hell in a Cell, the thought of him cashing it in has to be in the back of both competitor’s minds. If Kane can get a distraction free match against Rollins, Kane may actually walk out of the arena with the WWE Heavyweight Championship. It’s difficult to see Seth Rollins setting Kane up for the Pedigree without some sort of outside interference. Seth Rollins seems to always get help from his friends. The problem is, Seth Rollins has continuously alienated himself in the past few weeks, making it difficult for many WWE Superstars to have Seth Rollins back. One possible conclusion for Kane going forward is that he is able emerge as a top babyface in the WWE. With Kane going against Seth Rollins, he may or may not win the match, but Kane will get a boost in exposure going forward. This can only be beneficial for Kane, as he looks to reestablish himself as a force to be reckoned with in the WWE. Kane will likely have to lay off of Seth Rollins after Hell in a Cell. It’s hard to see this rivalry going much further, given the fact that multiple WWE Superstars are gunning after Seth Rollins. It will be interesting to watch the Demon Kane character continue to develop, since it seems like he is healthy enough to compete in the ring again.